Roy Thomson Hall is one of my favourite patios to hangout at! Featuring live music from around the world, food from Barque and lots of refreshing drinks. The secret is out! The Addisons are opening The Backyard and you're invited to the party that is sure to have the neighbours buzzing. There will be gourmet BBQ, specialty slushies and the Grey Goose bar will be flowing all night long. Free party to celebrate the launch of the season at The Power Plant! Cash bar available all evening. Spend Canada Day weekend soaking up the sun, checking out the tall ships and nibbling on international cuisine while shopping local vendors. Follow the FB page for announcements on a pop-up bar and restaurant parody that recreates Monk's Diner from 'Seinfeld'. There will be an opening party to get everyone into the Festivus spirit! Sugar Beach will transform into Toronto’s largest outdoor theatre. Free movies will be shown under the open skies on a two-sided screen set atop a barge. 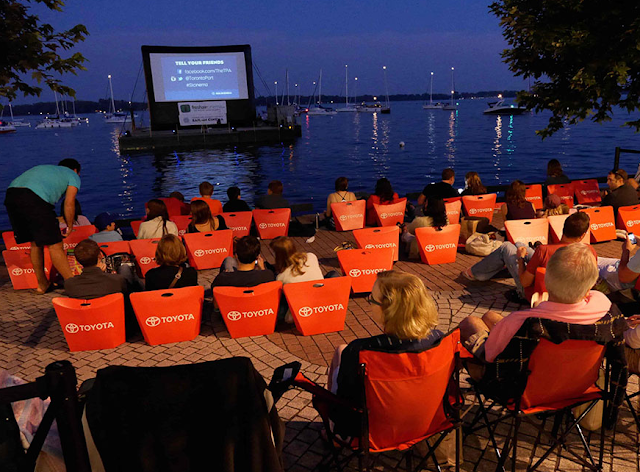 If you’ve got your sea legs, you can come to the movies by boat and drop anchor. If you’re a landlubber, bring a chair, a cushion or a picnic blanket.